Peach Salsa is an easy summer snack that can be made in minutes. Serve the salsa with chips or use the salsa as a topping for tacos, grilled chicken, fish, or pork. This salsa recipe is a summer favorite! Summer Peaches are the BEST! Peach season is my favorite because Utah has the BEST peaches. I look forward to peach season every year because we buy boxes of peaches from the farmers market. We eat as many as we can and let the juice drip down our faces…and then we get to work. We make all the peach recipes we can before they go bad. One of my favorite easy peach recipes is Peach Salsa! 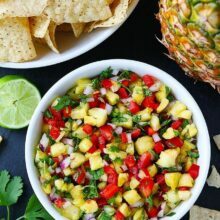 This fruity salsa is so fresh and delicious and the perfect snack for a summer day. This quick and easy salsa is a great way to enjoy summer peaches. Make sure you choose the best peaches. You want them to be ripe and juicy so your salsa has the best flavor. First, peel the peaches and remove the pit. Chop the peaches into small pieces and place them in a medium bowl. Now, you are going to add all of your traditional salsa ingredients: red onion, jalapeño, cilantro, and lime juice. And don’t forget the salt and pepper to bring out all of the flavors. See how easy that was? You can make fresh peach salsa in a matter of minutes! You will love the sweetness from the peaches with the heat of the jalapeño. The combo is amazing! Peach Salsa, A Fun Summer Snack! Peach salsa is a great appetizer or snack when served with chips. We like to make homemade pita chips or homemade baked tortilla chips to go with our big bowl of peach salsa. Salty chips are perfect with the sweet peach salsa. This salsa never lasts long at our house because we all love dipping into this fresh and juicy salsa! 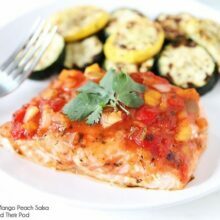 The peach salsa also goes great with tacos, quesadillas, burritos, grilled chicken, fish, or pork! It is a summer favorite! 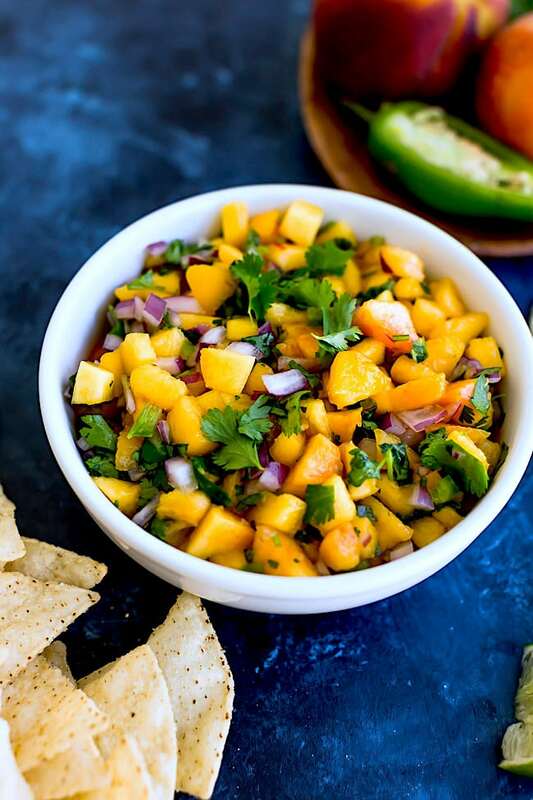 If you are having a BBQ, picnic, or summer pool party, make this peach salsa to share. It is a great dish to take to parties. This simple and fresh peach salsa is a summertime favorite! Serve with chips or enjoy with grilled chicken, fish, or pork! In a large bowl, add the peaches, red onion, jalapeño, cilantro, and fresh lime juice. Stir well. Season with salt and pepper, to taste. Serve with chips or with chicken, fish, or any Mexican dish. YUMMY!! Peaches are one of my favorite things about summer!! Thank you for the recipe, I am going to have to give it a try. This salsa looks delicious. I love your suggestions to pair it with chicken, pork, or fish. I think it would make such a refreshing dinner. Happy Labor day! i am completely drooling right now! so beautiful and the peaches right now are downright LUSCIOUS! enjoy your labor day girl! Nothing like fresh fruit 🙂 mm mm mm. I just got some carolina peaches- they are totally at their peak too (and so inexpensive!). What a great way to use them up. Happy Labor day! Sounds delicious. I’m really loving fruit salsa lately! Mmm does this ever sound tasty! I’ve got a few peaches in my fridge that are begging to be turned into this! I wish I were doing something fun on Labor Day…I’m cleaning house :/ Salsa looks so fresh and a perfect way to close the summer. Wonderful Idea. I hope your new kitchen will be welcoming you soon. I know how hard that can be. Mmmm I would love this on some BBQ chicken! a great way to savor the end of summer!! Yum, I love peaches and what a great idea for a quick and easy salsa! Love this with grilled chicken or fish! Awesome! I love fresh summer peaches dripping down my chin. I’m sure the salsa and chips were fabulous! This salsa looks so good! 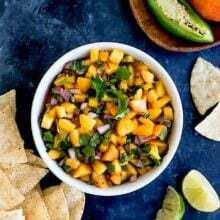 I also have made your mango salsa–delish! Thanks for sharing fun recipes. I love peach salsa, thanks for the simple & delicious recipe! I can’t believe you’re making such a beautiful salsa while your house is under renovation. That’s very impressive. The salsa looks fantastic! Loove fruit salsa! Yum yum! I just made this, but with mint and ginger. Going to have to try the cilantro and jalapenos too, looks so yummy! I will have to try it with mint and ginger. Great idea! Growing up in Georgia we always had bunches of peaches and I could never get enough of them. 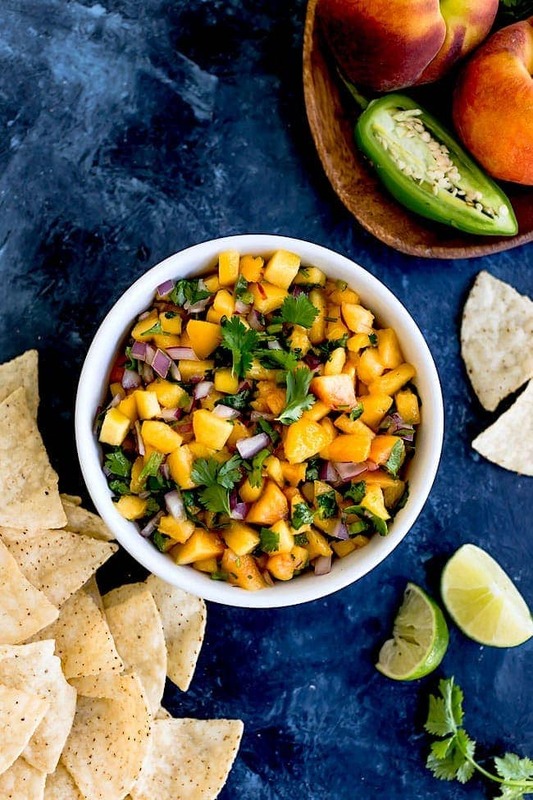 I love peaches and this salsa looks so good. Yummy! I love fruit salsas… this looks wonderful. Yum! What a wonderful looking salsa! What fun salsa, I could certainly eat the whole bowl myself!! I have been thinking about this since you mentioned it last week!! I’m picking up some peaches today – I’m hoping I find some time and energy to make this! This sounds delicious! I LOVE peach salsa! how light and refreshing, and even better with homemade chips! Looks perfect! Wish I had a neighbor with a peach tree! Made it and I loved it! I added a few serrano peppers from the garden for a little punch. Perfect over chicken tacos!! So glad you liked the peach salsa! Thanks for letting us know! Gorgeous pictures – I just want to reach out and take a bite! I just saw this on Becky’s site, it looks delicious! I have been canning peaches today and this is the perfect way to end my day. 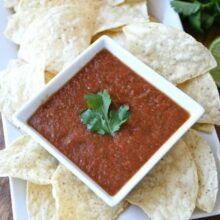 I would like to make this salsa, but was wondering if it’s okay to freeze it. 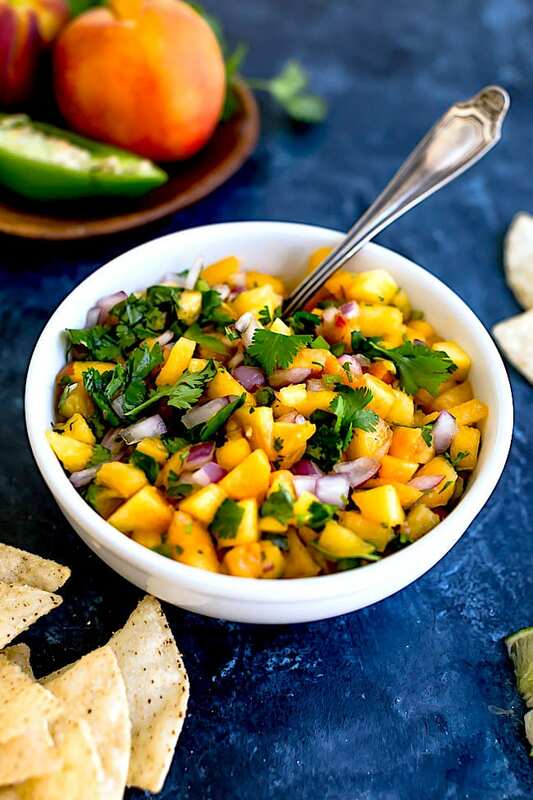 Pingback: Quick and Easy Peach Salsa | just a little organic. I just got fresh peaches from my mother-in-law’s peach tree…perfect timing! 🙂 Such a creative idea to use peaches for a fruit salsa. 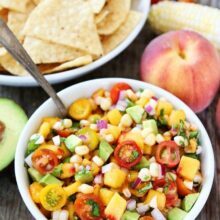 Love this summertime twist on salsa!